The Scott County Genealogical Society provides free genealogy forms for use by our members and website visitors. These forms are for non-commercial use only and can be freely duplicated as long as the copyright statement remains intact. The Pedigree Chart helps beginning researchers document what they know about themselves and their immediate families. This four-generation chart provides space for names, birth dates, and death dates. Don't worry if you don't have all the information at hand. You'll learn more as you get deeper into your research. The Family Group Sheet (FGS) is an important genealogy form used by most family historians. The FGS contains vital statistics information about an entire family unit, i.e., the parents and children. The form contains blank space to record additional facts and information about a person or family, and to document the sources where the information was found. It's a good practice to complete an FGS for each family you encounter in your research. Note: The FGS-Back-6 form allows space to document six children per family; the FGS-Back-8 form allows space to document eight children per family but has less space for notes and sources. Another handy form for genealogists is the Relationship Chart. This form traces two family lines back to their common ancestor and determines the exact relationship between any two people in those family lines. In this example, the common ancestor is Samuel. One family line traces its ancestors back to Samuel across the top row. Another family traces its ancestors back to Samuel up the left column. The intersection point between one family member on the top row and another on the left column shows the relationship between those two people. 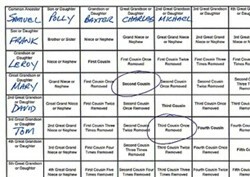 Shown here, Michael and Tom are third cousins, once removed; Charles and Mary are second cousins. The Correspondence Record is another useful form. It allows researchers to keep track of written inquiries regarding their ancestors to prevent duplication of effort. Some genealogists use one form to track all their inquiries; others use one form per ancestor or family group. This form has two sides; the back allows space for recording notes. The Census-Age Chart is a useful tool when when researching census records. The 1850 Census was the first one to document the ages of people, and this statistic has been tracked on all succeeding decile counts. By noting the age of the person and the census year, you can quickly determine the approximate year the person was born. Note that the date when the census was actually conducted in the enumeration district can make a difference in the actual year the person was born (according to the chart). For instance if the census was conducted in February, someone born in July would have been born in the year prior to what the chart indicates. This form has been updated to reflect the release of the 1940 Census. Cemetery sleuths can use the Cemetery Transcription Form to keep track of ancestors' graves. The form helps to identify and document cemeteries and their locations, as well as the names of the people buried there. The form includes space to sketch the layout of the cemetery and to make notes about burial information. This form has two sides; the front contains location information and has space for recording 20 graves; the back of the form has space for recording an additional 25 graves, and it can also be used as a continuation sheet for larger cemeteries. The Individual Time Line Event Log is used to document significant events in an ancestor's life such as birth, education, special awards, religious and civic affiliations, or military service. As researchers learn more about an ancestor, using this form will help arrange life events in the order in which they occurred. The Event Log provides space to document a narrative listing of events and also provides space to record notes and sources. Life events can also be displayed graphically on a yearly scale using the Individual Time Line Graph. The Individual Research Notes Form is a general-purpose, note-taking form that can be used for a variety of purposes when doing genealogy research. Use it to document miscellaneous information you might find about an ancestor before transferring the information to a permanent record. The form is a good tool for recording information found in various sources about one person. The Research Checklist provides a way to record things that need to be accomplished during your research. While searching for information about an ancestor, it's not unusual to discover a fact about another relative. Use the checklist to record an action item that needs to be addressed in your future research. The yearly Research Calendar can help you plan your genealogy trips and other research activities. Use it to highlight the dates for the national conferences you plan to attend, or lock in the dates for you society meetings. If you're planning a trip to other states, cities, or towns to conduct research at the local level, you can use the calendar to avoid scheduling conflicts. Or maybe you just need a one-page calendar to hang on the refrigerator! The Genealogical Will serves as instructions to your family on what to do with your collection of genealogical records and research materials. Is there someone in your family who shares your interest in genealogy? Add his/her name to the form. If your research centers in one specific area of the country, think about placing your files in that area�s public library or genealogical society. Your family history is an important investment. Every photo you�ve scanned, every family group sheet you�ve prepared, every source you�ve documented meant something to you, and it will mean something to those who follow us. Make sure it lives on for others.